I'm owner and designer at Creative Mom, mom of two beautiful kids and wife of darling husband. I always loved fashion,design, DIYing and crafting. Since that time when I was little girl I started to create clothing and accessories for my dolls. Being a teen I always made something special for myself and my friends. After my first baby was born I started my passion over again. Very fast it became popular with my family and friends. People at public places started to ask me where I got those baby clothing & accessories from. I was stay at home mom and decided to try my hobby to bring me some extra pocket money. But it became popular fast and transformed in to licensed home business. After my second baby was born we decided that I will stay with kids and make my boutique business from home studio. 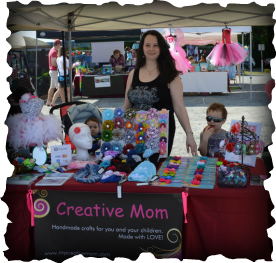 Now Creative Mom is getting more popular for it Tutus,Designed clothing for kids and adults,Accessories for Girls & Boys and Photo Props. We have friends among Photographers, Boutique Owners, Kids Spas, Event Planers etc. I'm very happy that I can stay with my kids,see how they grow and have my favorite hobby that brings money. All Creative Mom's products are made with LOVE, focus on quality, using my imagination and tendency to perfection. I will be happy to work with you and hope to hear from you soon!